Happy Bloggers Challenge Friday! This week's challenge is a sketch challenge. 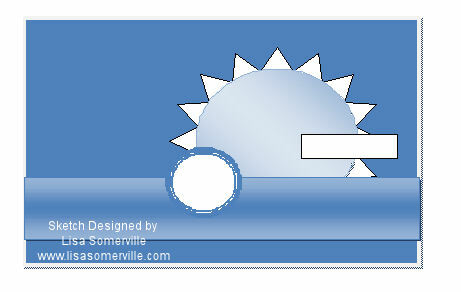 I choose to keep the sketch going the same way, but opted to change a few of the elements. The beautiful paper is from the Basic Grey Wisteria Pad, I matched it up with some Soft Suede and Vanilla card stocks. I used the Spellbinders Circle Die with the Flower paper, then layered it on a Scalloped Soft Suede Circle. The Butterflies were cut from Soft Suede adn Vanilla card stock, I added Basic Grey Pearls to the butterfly centers, and lightly rubbed Soft Suede ink on the larger butterfly. All butterflies are popped for added dimension. The sentiment is from Stampin' Up! - Hope Happens. I hope you'll find inspiration in this weeks sketch. If you'd like to play along, just leave a direct link in the comments section to your blog or gallery post. I'd love to see how you used the sketch. Thanks for stopping by, looking for more inspiration using this sketch, click on the Bloggers Challenge Logo on my sidebar to see what the other players created this week. Gorgeous card! This is a great layout and I love the design paper you used. Wow this is gorgeous! I love you take on the sketch. The designer paper is stunning.. Excellent! Thank you for the beautiful sketch.. I'll be going back to this one again! Oh wow, your card is GORGEOUS, Lisa!!!! I love everything about it! Your take on the sketch is spot on! Your color combo is PERFECT! Just an all around perfect card! Lisa you did it again. Your card if fabulous! I just love these butterlies on here. Some times I think people are really over doing it on their cards with this embosslet but of course yours is perfect. Love the pearl centers too! 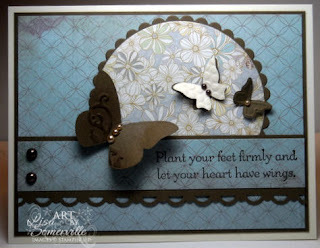 Wowzers- I love blue, and this card is fantastic- the DSSP is gorgeous, and I love the butterflies. Thanks for a great sketch to work with- I will use it again! Gorgeous card. Love the papers and the butterflies. I also like how you stamped the sentiment on the one panel. Gorgeous card Lisa, I just love the colors and your attention to details. I have a question, is the border punch you used Stampin UP punch. If so, how much is it and how can I obtain one? Thanks so much for sharing your amazing talent and caring spirit. Thanks!!! This is one of the most gorgeous cards I've ever seen. I love everything about it -- fabulous use of the DSP! You rocked it, girl! Love the butterfly. How beautiful! Really like the colors and how it looks like the butterflies are in the flowers! Gorgeous card with this sketch. I really like the butterflies along with that paper, very pretty! Simply beautiful!! Your card looks great and love the butterflies! Gorgeous! Love all of it! This is just beautiful, LISA! Such pretty colors and everything is just stunning:) Great job! Oh wow, I love this card. lol...you are I were on the same wavelength this week, Lisa! Love the muted blues in yours...great job! Fantastic combination of details, Lisa! Love the colors but how you used the scallop border punch and the butterflies is just wonderful! WOW!!! This card is drop dead gorgeous!! Love the colors and the butterflies!!! Just gorgeous!! Lisa, that paper is amazing as is the card!! Love it!! a beautiful card!! I love the color and the butterflies!! Just gorgeous, Lisa! Love the color combination you used.